ALL INCLUSIVE STAY - INCLUDES YOUR STAY, ALL TAXES AND FINAL CLEAN. H & M Villa Orlando - 4 bedroom/3 bathroom, private south-facing pool with privacy screening on sides and backing onto Conservation Land. Close to Disney and everything you need for a perfect 5 Star Vacation. Look no more for the perfect place to stay in Orlando . Highly Maintained and Extremely Clean!! Come and relax by the large sunny, southwest facing private pool backing onto conservation with privacy screening on both sides. Enjoy your morning coffee on the lanai and sunsets in the evening. This home has 4 bedrooms including 2 master suites. The floor plan has a very nice flow with a large living room and dinning room area that overlooks pool and conservation. There is also a second family room with an XBox gaming system for kids to enjoy. Come and relax after a long day at the parks in this very calm beautiful setting. THIS IS THE ONE FOR YOU!!! The location of our Villa is perfect!! close to Junction 58 off the I4, giving access to Walt Disney World in less than 10 minutes, easy access to all the Theme Parks, grocery shopping, shopping malls and restaurants, allowing you the time to enjoy yourselves on vacation – not sitting in traffic! Children’s Playground and Adult work out area within walking distance from Villa. "Beautiful Vacation Home! ★ ★ ★ ★ ★ We really enjoyed our stay at H & M Villa. The location was great! It was about 10 minutes to Magic Kingdom and all of the other parks. The home was very neat and clean upon our arrival. This home was very spacious with having 4 bedrooms and 3 full bathrooms. We knew right away that we had made the right decision in renting H & M Villa. Our granddaughter really enjoyed swimming in the in-ground pool. It was well maintained and the water was crystal clear! The neighborhood was well kept and extremely quiet. The owner, Helena, was very quick to respond to any question that we might have had. She was very professional and efficient. After a few days we did request that the air conditioner be adjusted down a little and she im"
"It Truly Is Our Home Away From Home! Date of Stay Apr 15, 2017 We have just returned home from our second stay at H & M Villa and it truly is our home away from home. We love it. I'm hesitant to give it such a great review because everyone will want to stay here!!! but I have to be honest, this house is in a perfect location and has a great layout with 4 bedrooms and a den - perfect for a large family. The owner ensures that everything is perfect and she is a pleasure to deal with. Helena looks after everything right from the start and I feel like we know her... She is a gem. The house is clean and equipped with everything - playpens, highchair, etc as well as everything you need in a kitchen and....even a Christmas tree! 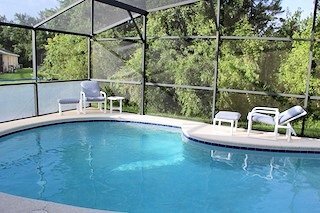 Disney and all other attractions are easy to get to and the gr"
"joann w. said... Feb 21, 2017 We were ”wowed” at first sight Sandy Ridge Drive, Davenport, FL, 33896, United States Date of Stay Jan 14, 2017 From the moment we walked into the villa, each way we turned, we were pleasantly welcomed. The tables were set, and each place setting coordinated the other. Towels were stacked high in the linen closets. As we began to cook and get meals ready, we didn't need any kitches gadgets. The villa was supplied with everything we needed. Pans, pots, serving platters were all here. It was absolutely wonderful. We brought a few things that we thought we would need, such as my electric griddle, only to arrive here and have one here already. This villa has a secure wifi, an important feature to me. The villa was so clean! 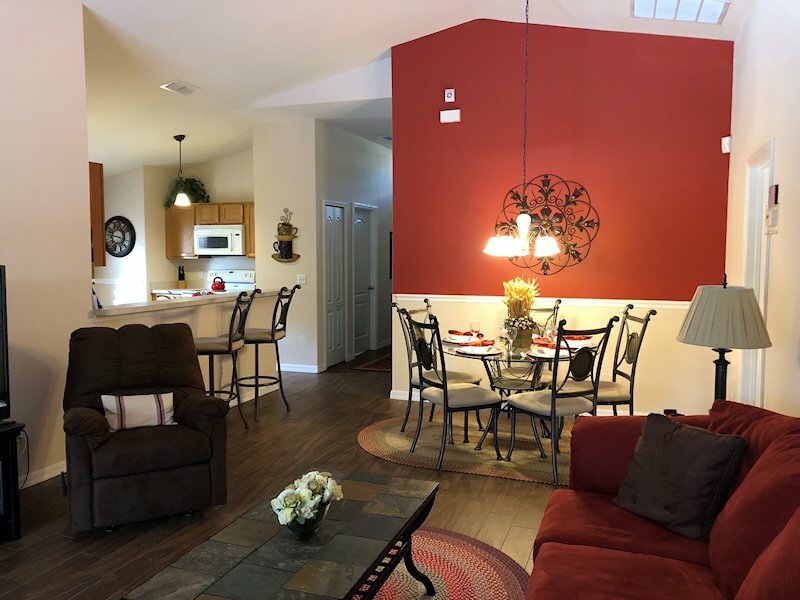 We met the managemen"
"Michelle K. said... Jan 6, 2017 We loved it here!Sandy Ridge Drive, Davenport, FL, 33896, United States Date of Stay Dec 28, 2016 This property had all the comforts of home, snuggled in a quiet community with proximity to restaurants, shopping and freeway access. Helena was always responsive all the way through our stay. We are a family of 5 and had plenty of room! I highly recommend this property and Helena to anyone looking for a stress-free stay!" "Anne H. said... Dec 22, 2016 Better than home! !Sandy Ridge Drive, Davenport, FL, 33896, United States Date of Stay Dec 8, 2016 This home is wonderful. From the time we walked in the front door, we had everything that we needed. The table was already set and looked beautiful. We were in town for my daughter's wedding and decided to rent a house instead of staying at one of the Disney resorts. We definitely made the right decision. The master bedroom had a huge closet and it's own bathroom. There was a second bedroom that also had it's own bathroom, which was perfect for my 83 year old mother. 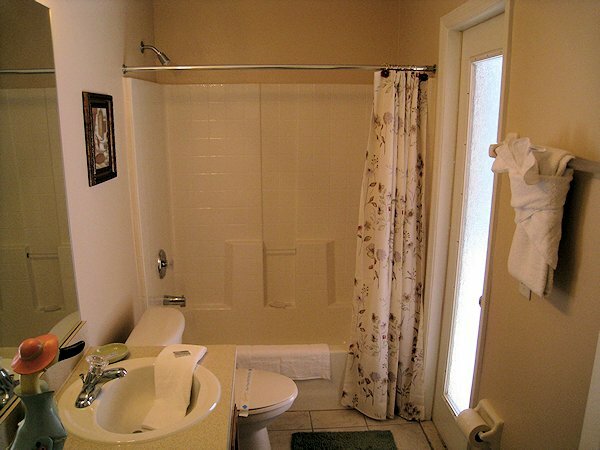 The third full bathroom was shared by the other two bedrooms. It was the perfect setup. The pool was a good size and super clean. There was plenty of outdoor furniture so we could sit outside an"
"hina l. said... Sep 3, 2016 Comfortable & Convenient home away from home - Sandy Ridge Drive, Davenport, FL, 33896, United States Date of Stay Aug 19, 2016 Our family of 6 (2 adults, 15, 12, 8, 4) felt right at home from the moment we walked into this home. On arrival, everything was clean and pristine. Kitchen was stocked with just enough essentials, there were plenty of linens to go around even after multiple dips in the pool, and beds were all comfortable. Pool was crystal clean, and I appreciated the entrance to the common bathroom rather than the master. House is about 5 mins from grocery store, gas, and some eateries. Community also has playground within walking distance. We didn't have any issues with the property, but Helena was in touch with us anytime we had a question/co"
"August 2016 From the ease of booking, to the excellent communication from the owner...I knew this would be a vacation to remember. The kitchen was fully equipped with everything we would need to prepare meals for my family of 6, including pots, pans, blender, toaster...and the list goes on. There was an abundance of linens and towels that accommodated our large family for drying off at the pool as well as showering and there were still clean towels left that we hadn`t even touched. The home itself was very nicely decorated and had plenty of space for us to relax after enjoying the pool and the park. I must mention that having 3 full baths was definitely a lifesaver for getting ready in the morning in a timely fashion. Beds were comfy, wifi was perfect, pool was amazing!!" "July 2016 Property exceeded our expectations; the online description does not do it justice. House was clean. Located in a quiet subdivision, away from highway noise. Beds & mattresses were comfortable, providing great sleep. Furnishings were in good condition. Pool was a hit with the kids. Disney theme parks were less than 20 minutes drive; grocery store (Publix) only a mile or two drive. Kitchen was stocked with kitchenware to feed 12 (we had 8 guests). WOULD UNCONDITIONALLY RECOMMEND Recommended for: Families with Young Children, Sightseeing, Age 55+, Romantic Getaway, Families with Teenagers"
"March 2016Both my husband and I completely enjoyed our one month stay in this villa away from home! From the moment we stepped inside we were pleasantly pleased for it was clean and very tastefully decorated. We loved the fact that it had 4 bedrooms and 3 baths because later in the month my family and grandchildren came to visit. The owner, Helena, was always available to speak either by email or phone and her property manager was readily available as well. There were many facets we loved about this place. First was the master bedroom. It had the most comfortable mattress! Next was it`s location. It was just minutes from a grocery store, drug store, pizza place and there was even a Dollar General just to name a few. Being just minutes to Disney was also a plus as well as other places." "January 2016 We enjoyed our stay at this home away from home very much. This home is very roomy, comfortable and kept tidy and clean. Loved the layout and the decor. Plenty of shopping and restaurants nearby and of course Disney World. I would definitely recommend this home to family and friends." "December 2015. Spent my birthday with some friends golfing, this place was perfect and roomy. You could bring your whole family and have plenty of room. Great layout for 1700 square feet"
"I booked this home for family that was coming for my daughter’s graduation. Everyone was in LOVE with this vacation home. It’s so cozy & beautifully decorated! The family said their stay was incredible. We will recommend it to everyone we know." "I would deffinately reccomend this home! It’s a beautifully set up home able to accommodate our family of seven. It was clean and nicely decorated! 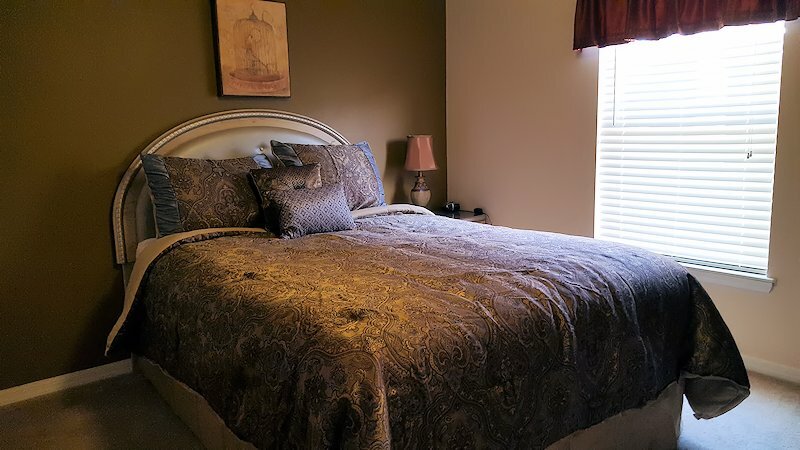 The house was very well equipped, there was nothing that was not made available for your stay!The villas location was very convenient, close to everything that Orlando has to offer. Helena, the owner , was absolutely a pleasure to deal with! We would stay again without hesitation!" "April 2015 - “A Vacation to Remember!” We were so pleased with this house and can’t say enough about how well the property is looked after. We were blessed to be able to stay a month here. 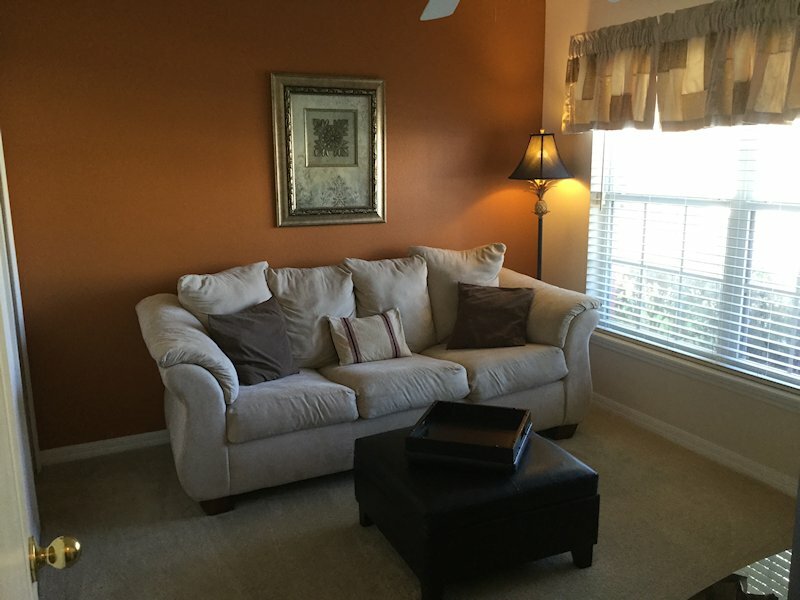 The location was perfect for us - close to the Airport, shopping, Disney parks - everything! It’s in a community where we felt very safe and away from the busyness of it all. We had great walks in the evening and met some wonderful neighbours. Helena, the owner of the home is wonderful to deal with - right from the initial booking to departure, she was on top of everything. The house is well maintained and Helena has thought of everything! You will not need to bring a thing from home, other than personal belongings. The pool is also well maintained and it’s beautiful to sit out in the "
"January 5, 2015 - My family and I enjoy staying at this property. It felt just like home. It had everything we needed. The neighborhood is lovely and quite . so close to the parks and shopping centers. The owner of this place is super accessible any question I had she would get to me right away. I try with other places and there response time was horrible . but Helena is super nice always there. That was a big plus for me. Overall The home is worth it . super clean spacious equipped with all your essential .the pool is the magic touch for the kids, lovely home enjoy every day we where there. So worth it can’t wait to go back I definatly recommend this lovely home." "We booked this villa as it seemed to offer the ideal accommodation configuration for us, 3 couples. With 3 en-suits it was ideal for us. All fixtures and fittings were of a superior standard, and carefully chosen to enhance your stay. Good sized kitchen with plenty of equipment. 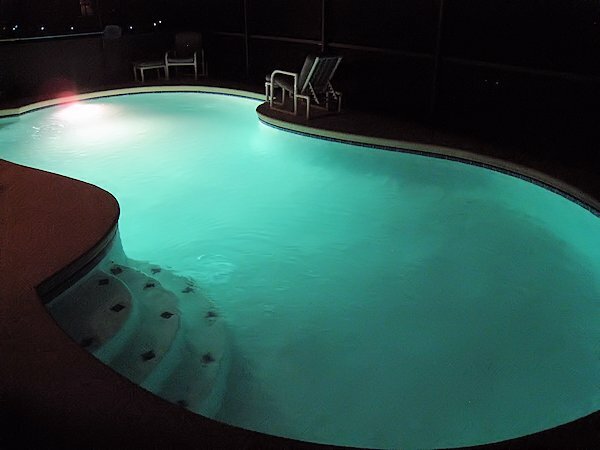 The private pool was ideal to come home to after a busy day at the attractions. Really can’t fault anything. Will without doubt recommend to anyone and hope to be back." "The owners of H&M Villa truly want you to enjoy your stay here. Helena is very easy to work with and communicates with guests in a timely professional manner. She makes you feel welcome and practically like family. Our family of 6 (2 adults, 2 teens, and 2 kids) stayed here for our visit to Disney World over the summer of 2014. 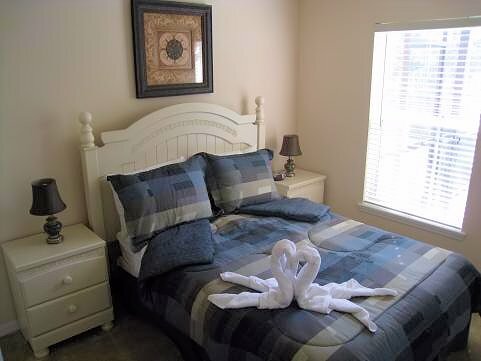 The villa location provides quick and easy access to all Disney Parks. Also, a Publix grocery store, CVS drug store, 7-11 gas station and a few eateries (Subway, Chinese, pizza, McDonald’s) are about 1-2 minutes away. There is a Chili’s 3 minutes away. The photos and villa description are exactly what you get. We liked not being in the hustle and bustle of the touristy busy crazy spots. 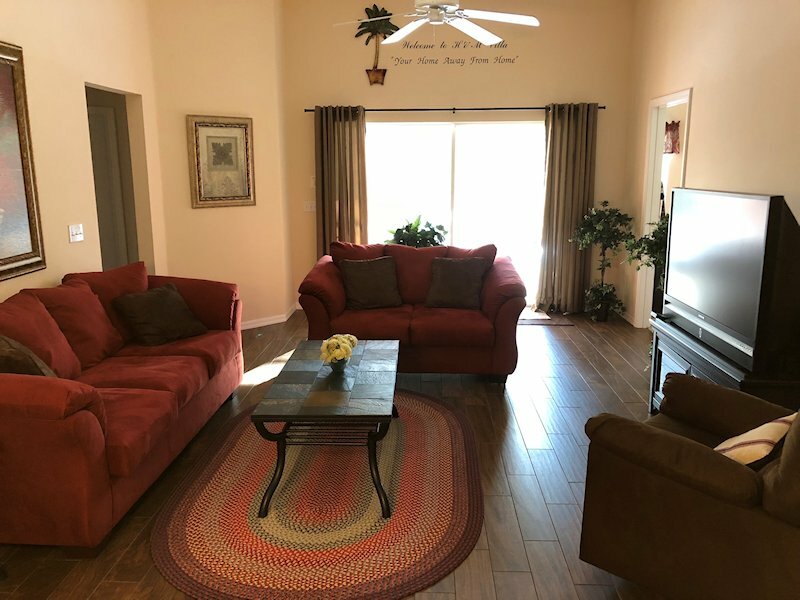 On the days you don’t visit the parks or once you return home,"
"JULY 2014 - The villa was very much a home from home; it had everything we needed and more and was absolutely perfect for my family, spacious and comfortable and a lovely pool. The villa is so beautifully furnished and in such a lovely neighbourhood, very conveniently situated for the Disney parks and for shops and restaurants. There is a large Publix just a few minutes away and so many places to eat nearby. We can’t thank Helena the owner enough for all her help, she made booking the villa such an easy process, we always felt that nothing was too much to ask. She could not do enough for us and she always has a speedy and helpful reply. A big Thank You Helena." "H & M Villa July 13, 2013 From the search all the way to the stay, I couldn't have asked for better information, response time, and the most beautiful vacation house to stay at for our family vacation. The pictures are exactly what the house looks like, there is nothing you need as the house is full equipped. The owner was very professional, friendly and awesome to work with. The house was flawless.There was absolutely nothing wrong and we couldn't have want for anything additional. All the rooms were good sizes with plenty of space so no one was on top of anyone else. The pool was a pleasant treat to enjoy after our days at Disney or on our relaxing days. Very convenient to Disney, grocery store, fast food restaurants. Would definitely stay again as well as recommend to all family and f"
"Very Nice!!! June 23, 2013 We were very please with the Villa. It was very nice and cozy. Our kids loved the swimming pool and Xbox. The only issue we had, was the pool light wouldn't work. We called that night an they were there the next morning to fix it. Also, the other thing we didn't realize... is you have to supply your own toilet paper,paper towels, dish soap,dishwasher soap,garbage bags ect.... That was a bit of a bummer. Other than that, we loved the house. Thanks so much!! " 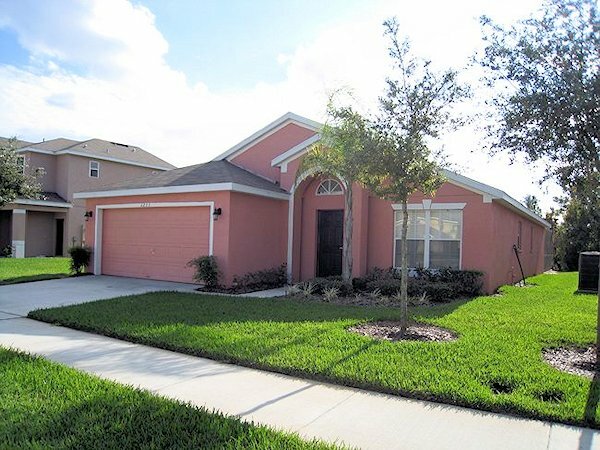 "exactly what we wanted March 2, 2013 Clean, spacious, quiet, and close to Orlando. I would stay again. " "home speaks for itself May 9, 2013 my husband and I took our2 granddaughters and daughter to Disney world , we stayed in the lovely how and it was more than we expected. it is close to restaurants the theme park shopping . we were busy and on the go a lot and didn't have time to enjoy the pool but it was very well kept up. the play ground directly be hide the house was a plus. if you. my family and I would come back and stay in this home again, thanks for a great stay Dortch Family. " A $300US deposit is due at the time of booking, which confirms your reservation. Balance of rental is due 5 weeks before arrival date. Security Deposit $200US requested week of your arrival and refunded 48hrs after departure and held on PayPal. Stays of less then a week are plus a $100US Cleaning Fee. Please inquire about early bird specials, last minute specials and extended stay discounts (3 weeks or more). This light, spacious family room with vaulted ceiling overlooks the pool and conservation area. It features ample, comfortable seating for all to watch television or movies on a 50 inch DLP television. A DVD player, Stereo system with speakers and IPOD docking station is also provided for your enjoyment. Wireless High speed internet is available anywhere in the home, just bring your laptop. Sliding glass patio doors gives you access to the large south facing deck and pool. This room features a formal dining area which is combined with the living room and seats six people comfortably. The open-concept kitchen leads directly to the dining/living room. 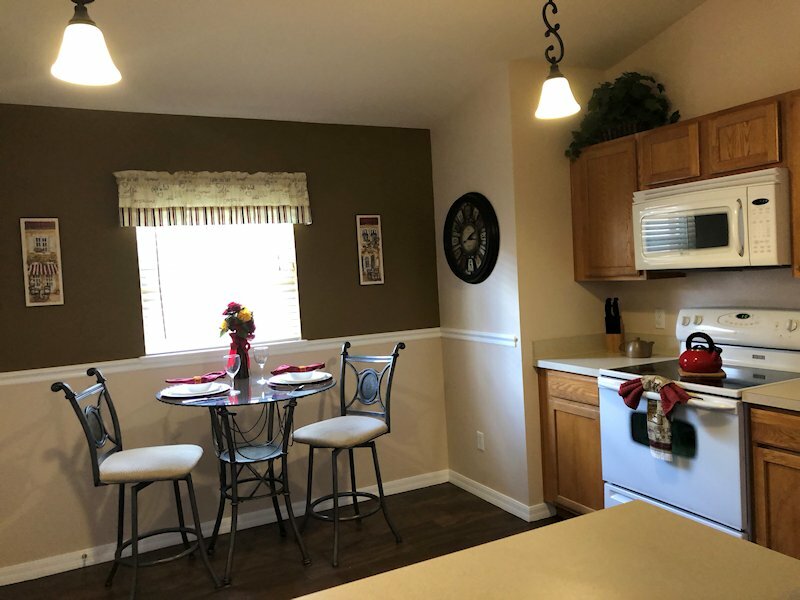 It is fully equipped with every convenience you could wish for including: full size oven, refrigerator/freezer with ice-maker, built-in microwave oven, dishwasher, toaster, coffee-maker, etc. This stunning bedroom overlooks the pool area and has an elaborate king size bed, with luxurious bedding, TV with remote and radio alarm clock are also provided for your use. The room also has a ceiling fan for your additional comfort. There is also a large walk-in closet. An iron and ironing-board is also provided in the walk-in closet. The adjoining en-suite bathroom has a large walk-in shower. A linen closet with extra towels is also provided in this en-suite. A safe for your valuables is also included. This room is furnished with a queen-sized bed, and ceiling fan. A 15 inch TV with remote and radio alarm clock are also provided. The en-suite bathroom features a walk-in shower. This bedroom overlooks the pool area and has a double size bed, a large double closet, ceiling fan and radio alarm clock. 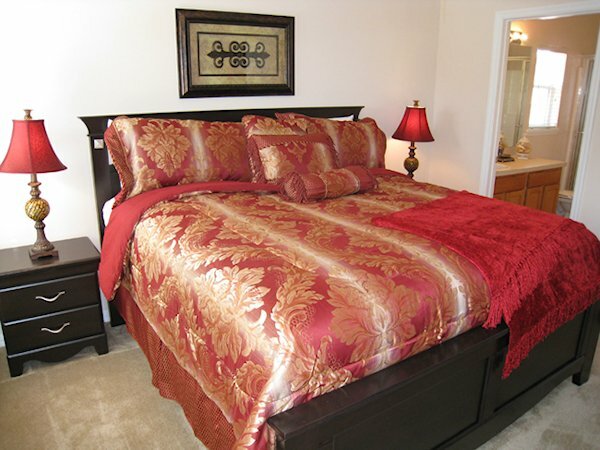 This bedroom is furnished with two single beds, a large double closet, ceiling fan, radio alarm clock complete this room. 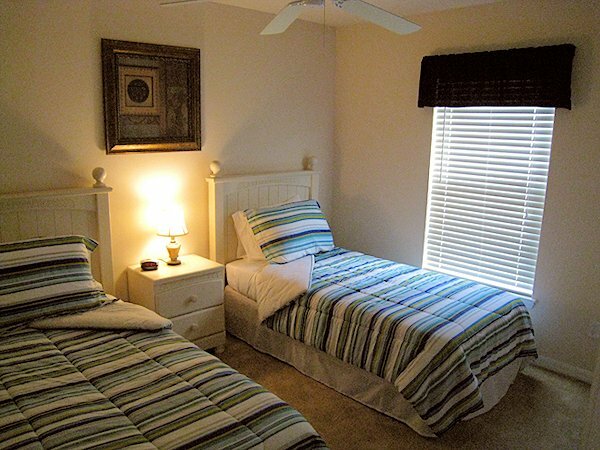 Both the double and twin bedrooms are serviced by an adjacent bathroom with large bath/shower. This bathroom also provides access to the pool area. Between these rooms you will also find a Linen Closet with towels and extra pillows and blankets for your use. This room is in front of the house. It provides a queen sofa bed (ready with linen, blanket and pillows) and can be used as 5th bedroom. If not required the room can be used as an additional family room. A 26 inch LCD TV, DVD player, portable radio/CD player, and XBox 360 gaming console is provided for your enjoyment. Relax and put up your feet on the leather ottomans and enjoy. The room provides a closet and ceiling fan. This is the perfect place to unwind and take in the breathtaking view of the pool and conservation woodland. Extended pool deck offers the chance to relax in the sun all day and late into the evening. Relax as you watch the sun go down. The large, private, southwest-facing screened pool has privacy screening on sides and backs on to Conservation, the deck area features a 30ft x 15ft pool with underwater lighting for that evening swim. For the cooler winter months there is a pool heater and blanket. 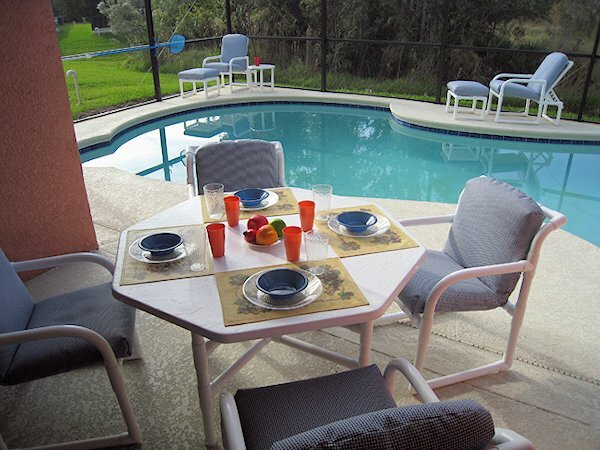 There are four cushioned chairs and a table so you can sit and enjoy your meals by the pool. A covered lanai (porch) with ceiling fan and light provides the perfect setting. There are also two cushioned sun loungers and a small table for your relaxation. A child safety fence is also available for your peace of mind when the pool is not in use and can be removed when no children in the reservation. A brand new Heavy-Duty top of the line pool heater has been installed so guests who pay for pool heat, actually get a heated pool!! We have also installed a pool blanket to keep heat in the pool overnight. Recommended in winter months, November to March is $25US per day including the 12% State Tax. •	Key code access to the villa, so no need to waste time collecting keys after your long journey.